The Ricardos and Mertzes are packing for their Pan American Airlines flight (# 155) home when Ricky warns his souvenir-crazy wife that any baggage over sixty-six pounds will cost extra to ship. She finds it impossible to leave anything behind, particularly a twenty-five pound hunk of rare Italian cheese, a gift for her mother. Assuming babies travel free, Lucy disguises the cheese as an infant and smuggles it aboard the aircraft. Seated next to her during the flight is Mrs. Evelyn Bigsby, mother of four-month old Carolyn. To be friendly, Mrs. Bigsby asks Lucy what her baby is named. Lucy: "Cheddar, er ... Chester!" When the stewardess offers to warm the babies' bottles, Lucy admits she didn't bring any, adding: "He's too fat anyway." Being a good neighbor, Mrs. Bigsby offers Lucy one of Carolyn's bottles. When the heated bottle is presented, Lucy gulps its contents: "he doesn't like to drink by himself." One hour into the flight, Lucy learns that babies do not travel free and that passage will cost thirty dollars. Ethel and Lucy attempt to solve the problem by devouring the mammoth hunk of cheese. When Lucy returns to her seat minus little Chester and lets Mrs. Bigsby in on her gag, the woman screams. In New York, a U.S. Customs official is trying to piece together the details. Meanwhile, a newsreel cameraman is itching to get footage on Ricky and the band, who are about to open at the Roxy Theatre. When the musicians attempt to play "Home Sweet Home," the music they make is silent. Leave it to Lucy - she stuffed the instruments with the cheese ("the trombone was easy, but that piccolo..."). 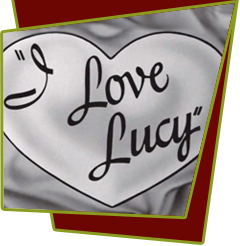 Special Notes: Another example of using real people's names - Evelyn Bigsby was a writer for a TV magazine who often penned articles about "I Love Lucy" and other Desilu programs. Jerry Miggins, "Lucy" propman, rented the musical instruments from Ellis Mercantile Company in Hollywood and then spent all day on April 6, 1956 getting the cheese out of them before returning them to the rental company. This was the last episode produced by Jess Oppenheimer, who, the following week, joined the NBC Television Network as a program executive. Frank Nelson (Customs Officer) and Mary Jane Croft (Evelyn Bigsby) would return in Season 6 as Ralph and Betty Ramsey, the Ricardo's next door neighbors in Connecticut.